Another week has flown right by - and here are this weeks digitally picked .org selections by Colin. Our theme seems to be very eco and park like - grass everywhere you go, park benches out of bike racks, flower fonts, and some ghosts! oO posted this over at .org and i can’t stop playing with it - so it’s here for those who missed it. Click the pic already! Hey how rad is this Futura wall lamp by Rob Zinn? Reminds me of the cover art by Peter Saville for Joy Division’s Unknown Pleasures album… just a little bit. It comes in four different color schemes: Cool, Warm, Major, and Minor. The shade consists of 5 white plastic planes whose reverse sides are printed with vivid colors to reflect colored light onto the preceding planes. Suspension of Disbelief: a magical world of mischief, memory, and imagination… over at Volume One, is my official 2am zone out happy/trippy/”hang-in-there” flash to stare at tonight. This new season from Matt Owens (thanks!). Check out the movie and print aspects of this great project as well… you can’t afford to miss seeing all of these! 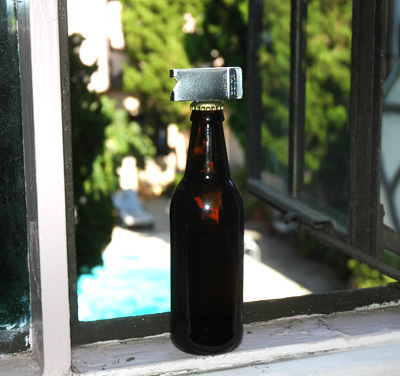 Our fun intern Caroline and I played with the Beerclip (think money clip + bottler opener) - and overall we think - great concept, mediocre execution, but it WOULD be handy when you need one and don’t have a bottle opener around. My take on it? The leverage is lacking, its kind of ok with a wad of malleable cash, but put a few credit cards in there and its just hard to use. And you’re not about to take everything out of the clip when you use it are you? And the angle you need to get at it properly is a little tough. BUT it DOES work. And i think its nice to have as backup - leave it in the car or something. Nice and flat and discreet. Baldguy Greetings have the guts to say the things you don’t. OR they at least make it harder for the recipient to see it coming, because this isn’t your usual kind of greeting card - on the inside. I know this made its way around already, but Shade Elaine and i helped get their site together, and as i was cleaning through my desk, i realized that in working on it for a while, we forgot to post about how much we loved them! 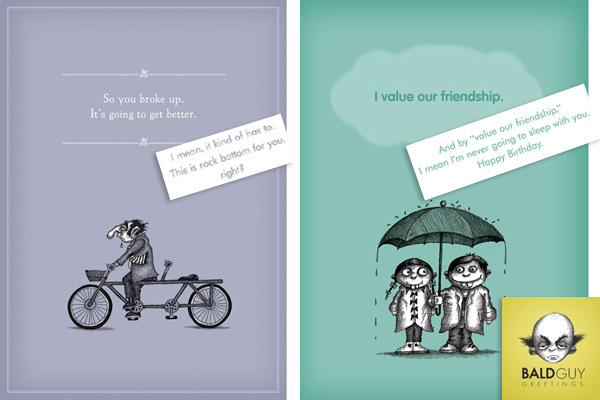 With adorable cards like “I value our friendship - and by ‘value our friendship’ I mean i’m never going to sleep with you. Happy Birthday.” and “So you broke up. It’d going to get better. - I mean, it kind of has to. This is rock bottom for you, right?” how can you go wrong? There are some things a card manages to get away with that just don’t work as well in person - and for those moments, we have the Baldguys. Free Tshirts over at Bank Of America - I forgot how silly shirts in cubes were - and how fun it was to open them. Also the fact that it says “I <3 Helping People”. Another Berlin installment, as i clean out my inbox from RUGenius ~ She came across a T-shirt shop named “fleischerei” which translates to Butcher Shop. And it really is an old butcher shop, using the old meat cases and all! So more pictures below… if anyone knows more, let me know and i’ll update this post, but for now, it seemed worth sharing the pics. RUGenius has an eye for street art ~ and she sent me a ton of images showing me some of the better pieces she stumbled upon, so if you’re curious about the street scene in Berlin, check out some of her finds below. Our first installment is on a brilliant and unique shopping experience that has popped up around Berlin, the Kwikshop where everything for sale is in stacked cucbicles in the large front window and can be purchased from a clerk via a small hatch. These tiny storefronts shops specialize in catering to window-shoppers and the immediate needs of the populace. The ultimate in convenience for both the shopper and seller as the stock can easily be switched around to suit the current climate / needs / mood. Raining out? Put out the galoshes and umbrellas. Had a little too much fun the night before? A Kwikshop can set you right with a clean set of underwear and toothbrush/toothpaste. Even if you need something as obscure as german golden and diamond ring rubber stamps, they have what you need, when you need it. The whole idea is just great and completely random but brilliant. So John Varvatos and Converse are responsible for that whole slip on/laces-free chuck taylor phenomena that won’t seem to go away. (Love it - Hate it - its inescapable). So with their use of hidden elastic to mess with people heads, i simply had to post up the new Crazy Laces, where i’m assuming they leave out the elastic on the inside, for the elastic laces you see. Slightly messy, kind of fun. Especially those mini eyelets. Looks like Rubin over at CoolHunting got his hands on a pair - i might have to pop over and check them out at the store later. This is the Logitech NuLooq, i have been trying to figure out how i missed this when the press release came out a few months ago, but none the less - here it is. For photoshop junkies like us, and those who need new ways to interface with their tech. I’m curious - have any of you played with it? and the new ToolDial? Just noticed the Amazon page for it and the reviews seem surprisingly good. As for ToolDial, just downloaded the demo, and its actually kind of nice… will try it out for a few days, but off to get some 3:30am sleep now.